In the 2009 Copenhagen Accord, world leaders adopted a threshold of 2°C global warming above pre-industrial as indicative of two disparate futures – one with a world of tolerable levels of change and the other with a world of severe, undesirable impacts on people, the environment, institutions and infrastructure. Global emissions of greenhouse gases have, however, continued to rise, making it more and more likely that this 2°C ‘guardrail’ will be exceeded. 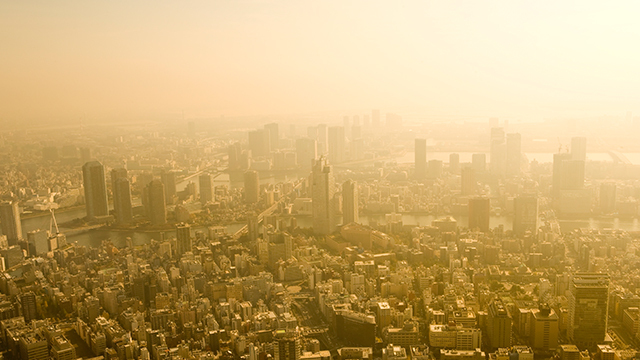 This has led to a need to explore the consequences of even higher levels of warming. The global community deserves to have an understanding of the consequences of exceeding this guardrail in order to inform judgments about how urgently to act to mitigate warming. Additionally, in case the ambitious 2°C threshold was to be surpassed, a pressing question remains: what impacts of climate change are communities likely to witness, and how much time do they have to adapt? The science underpinning climate projections has developed substantially since the 1990s, allowing a much more comprehensive assessment of climate risks. The international climate negotiations have also evolved. In previous years, scientists sought to find solutions for the allocation of the global “carbon budget”, determine the threshold of acceptable emissions levels, and solve the puzzle of long term-planning from present day to the next century. Especially since the Cancun Adaptation Framework (2010), consumers of climate science – and those funding corrective actions – have widened their interest in how communities may need to adapt to climate change and to what loss and damage could result when coping mechanisms and risk management strategies fail. Experts working in the High-End cLimate Impacts and eXtremes project (HELIX) project are trying to better define the extreme futures we may face at 2, 4 and 6°C warming. While mitigation is the priority for the international community, communities will also have to deal with local impacts. A set of credible, coherent, global and regional views of different worlds at 2, 4 and 6°C will assist decision-makers and the research community in delineating actionable and manageable adaptation plans. Alongside planned adaptation measures, communities are likely to adapt autonomously to the changes around them. In this vein, one objective of the HELIX project is a better understanding of how climate changes and extreme events will erode livelihoods and affect peoples’ ability to cope with abrupt changes. This reality has significant effects on livelihoods decisions, for example, the decision to migrate. The project also assesses how environmental stress increases vulnerability for others, leaving them less able to migrate, for example, to meet basic needs and supplement their family’s income with employment in a nearby city. Focusing exclusively on global averages and uncertainties holds little relevance to the local communities affected by climatic changes and extreme weather events. Decision-makers also have a stake in understanding how changes in the global climate will affect their region and sub-region. However, the current state of climate science is unable to give perfect forecasts of regional impacts. There are a few “truths” that experts do agree on, such as: some regions will experience warming and its effects faster than others. For example, even in more conservative scenarios which limit global average temperature rise to 2°C, temperatures in the Arctic could increase by 8°C before the next century. Similarly, some projections for global sea-level rise are 0.87 m (2.9 ft) and 0.72 m (2.3 ft) but will be lower in certain regions than others, for a few reasons. One important consideration is the powerful gravitational pull of ice sheets at the poles. This means sea-levels are likely to rise higher in the Eastern United States than in Alaska and the Northern Isles of the U.K. – although this force will weaken as polar ice melts, which is occurring at an alarming rate. These differences are paramount to ensuring appropriate and cost-effective planning for impacts as well as for allocating international funds. HELIX and other 2°C+ research seeks to inform the design of effective medium to long-term adaptation efforts (mid-century and beyond). Playing the waiting game will not pay off: because anthropogenic climate change is expected to be the main influence in these scenarios, actions taken today will have important consequences. If we do not adequately account for the range of potential changes in temperature, precipitation and over climate quantities, local level projects for biodiversity, infrastructure enhancement or agricultural productivity may not be sustainable or effective. An important set of tools is provided by higher resolution, more data-hungry, and more refined ensembles of climate models, which better help us assess the range of possible implications of 2, 4 and 6°C temperature increases. When can we expect to live in a world of climate extremes (2, 4 and 6°C)? One such ensemble is CMIP5, which comprises around 30-40 models projecting future changes in temperatures and precipitation for different scenarios of future emissions. From these we are able to estimate relevant derivatives such as crop yields and water availability. Encapsulating our understanding of how the climate system works, and backed up by observations, climate models project which areas of the world will warm faster than others for the same global mean surface temperature, as shown in Figure 1. Land areas will warm faster than ocean, but with some variability; the poles are also projected to warm more rapidly. Figure 1: Annual mean regional temperatures at 4°C global average surface temperature warming (CMIP5 ensemble mean). Courtesy: Richard Betts/ HELIX project. By comparing the range of responses from a handful of agreed scenarios output by different climate models, we can assess the range of potential timings of reaching different warming levels. 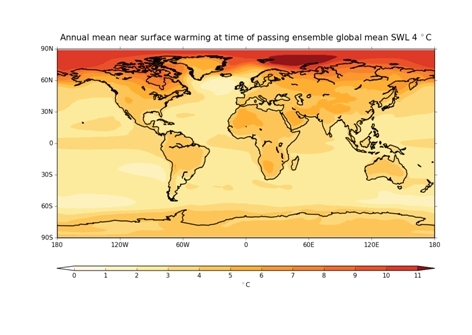 Figure 2 shows the range of projections for global mean surface temperature increases for the main scenarios used in projections. Despite uncertainties in the timings of reaching specific warming levels (2, 4 and 6°C), living in a >2°C by the end of the 21st century (2081-2100) is a very real possibility. Indeed it could easily occur by the middle of the century. 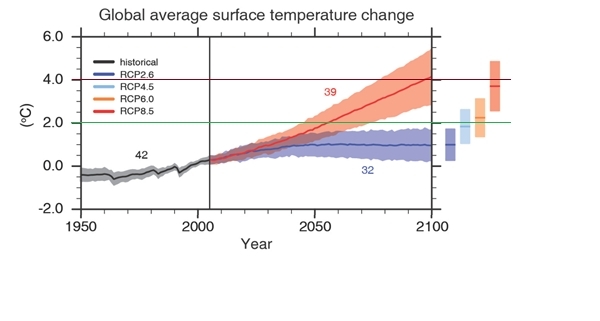 In a credible scenario in which action on climate change fails to adhere to an emissions path consistent with the 2°C target, a world 3-5°C warmer than pre-industrial is possible by the end of the century. Mean temperature increases are expected exceed 2°C in most land areas by the end of the century. Work is also under way in the HELIX project to build on previous efforts downscale climate model projections to be more regionally relevant (see, for example, the CORDEX project). Figure 2: Despite uncertainties in the timings of reaching specific warming levels (2, 4 and 6°C) – demonstrated by the bands of uncertainty – even in the most conservative scenario (RCP2.6) living is a >2°C world by the end of the 21st century is a very real possibility. Global-mean surface warming by the end of this century (2081-2100) is likely to exceed 1.5 °C relative to 1850–1900 for all RCPs except RCP2.6. It is likely to exceed 2°C for RCP6.0 and RCP8.5, and more likely than not to exceed 2°C for RCP4.5. The numbers on the graph indicate the number of models used to produce the projections (clockwise from left: 42, 39, 32). NB: the global warming shown here is relative to 1985-2005, whereas the 2C target (and HELIX’s 2, 4 and 6C Specific Warming Levels) are relative to pre-industrial, which was about 0.6C cooler than 1985-2005. Source: IPCC Fifth Assessment Report, 2014. Are we heading towards “dangerous” or extreme climate change? Five years have passed since the Copenhagen Accord pledges to the 2°C guardrail. This year at the Conference of the Parties to the UN Framework Convention on Climate Change in Paris (COP21), delegates from over a 190 nations will again embark on the regular discussions on limiting global climate change and its nefarious effects. Reaching an extreme and unprecedented world 2°C warmer than our own within our lifetime can no longer be considered uncertain. Building a set of uncertain, but possible, worlds can help decision-makers assist communities as they adapt to the environmental conditions changing around them.